In 1941, acting at the request of Congress, President Franklin Delano Roosevelt issued a proclamation that December 15 would be known as Bill of Rights Day. When doing so he described the Bill of Rights as “the great American charter of personal liberty and human dignity.” However, his proclamation makes clear that Bill of Rights Day is not merely a day of historical commemoration or of collectively patting ourselves on the back for our own do-goodery. One of the most dynamic mobilizations for freedom and for human rights we have witnessed has been the Black Lives Matter protests. These protests fight back against the police brutality, state violence, and deliberate neglect that stems from the negation of the worthiness of black lives. By fighting back against these policies and clearly proclaiming that Black Lives do in fact matter, this movement is clearly the type of mobilization for freedom and for human rights that we should celebrate on Bill of Rights Day. Yet, it is impossible to do so without raising troubling questions about the very nature of the Bill of Rights. One of the reasons why black lives are viewed as not mattering, why black Americans are disproportionately singled out for police brutality and mass incarceration, and neglected by the state in terms of distribution of the public services that form the very basis of a democracy is because documents like the Bill of Rights were deliberately written to exclude whole segments of the population. How then do we deal with this problem on Bill of Rights day? 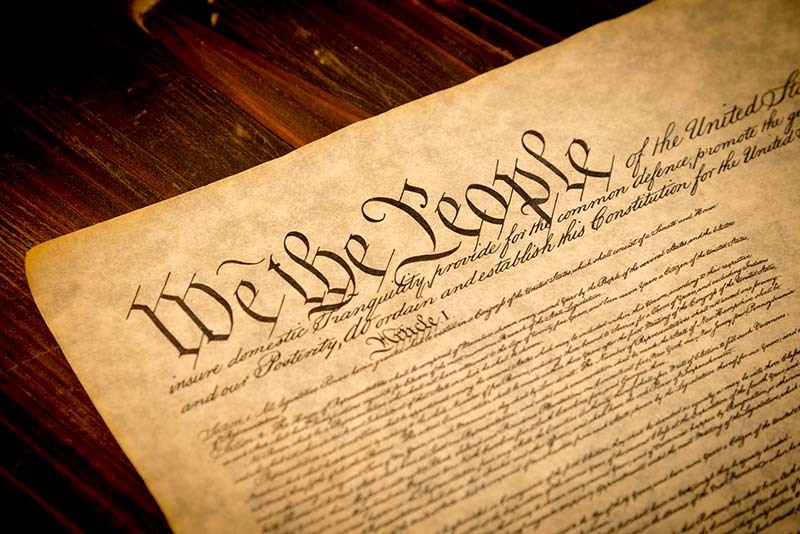 Do we ignore the historical realities under which the Bill of Rights was drafted, the realty of exclusion, supremacy, and hierarchy that have defined our nation for so long, because it is politically convenient to do so? Or do we instead decide that the Bill of Rights has no use to contemporary struggles? The answer to this question rests in a Langston Hughes poem entitled “Let America Be America Again.” This poem was written during the Great Depression, a time when many Americans felt as though the “American Dream” was no more, and longed nostalgically for its return, i.e. for “America to be America again.” Hughes echoes this sentiment, but continuously reminds the reader that “America never was America to me” and “There’s never been equality for me nor freedom in the homeland of the free.” Who is this “me?” It is African-Americans, Native Americans, poor whites, and immigrants. Hughes continues on to say that although America has “never been,” that it will be one day, and it will be exactly those who were excluded that will make it be. Those who were unequal and unfree in a land that promised equality and freedom are the very ones that will force that promise to be fulfilled. We can look at the Bill of Rights as a similar promise—one that has never been fulfilled. Early on the Supreme Court refused to enforce the Bill of Rights on the states and many state governments enacted laws criminalizing abolitionist speech. Later on many of these same states would continue to bar labor unions or even just publications that promoted them. Many states enacted criminal syndicalism or anarchy laws, laws aimed at making it illegal to discuss socialist, anarchist, or communist ideas, laws with the specific purpose of destroying the then-nascent working-class movement. Nationally, similar abuses occurred. Roosevelt, who issued the proclamation creating Bill of Rights Day, himself was responsible for the internment of Japanese-Americans, as well as the jailing of members of the Socialist Workers Party and dissident union members in what was known as the “Minneapolis Sedition Trial.” Even after the Supreme Court extended the Bill of Rights protection to the states they still sanctioned the federal government’s jailing of Eugene Debs and others who opposed war, or held leftwing political philosophies. Even after Congress expressly amended the Constitution to give it the power to stamp out racial discrimination, the Supreme Court still found early civil rights laws to somehow be unconstitutional. Today, despite of the tremendous wave of repression we currently face, some of these past events seem unthinkable. What happened? It was not that courts or politicians became more benevolent; it was that people fought back and organized. These struggles against specific moments of repression have forced wider recognition of personal liberty and human dignity, to help make the Bill of Rights more than a piece of a paper. No struggles have done more to fulfill the promise of the Bill of Rights, than those led by people who were excluded from its protections. Struggles led by people of color, women, LGBT people, the working class have demanded both their inclusion in the Bill of Rights’ protections and in the process expanded our definitions of what it means to have personal liberty and human dignity, freedom and human rights. When Roosevelt stated that we should set aside Bill of Rights Day to remember “the democratic and peaceful action by which these rights were gained” it is doubtful he had these struggles in mind, but it is precisely these struggles we should remember. It has been the mass movements from below forcing concession from the political class that has led, little by little, to the promises of the Bill of Rights being partially fulfilled. These are the democratic actions by which rights are gained. If we were to reassess the Bill of Rights’ present meaning and living worth for the year of 2015, what would we determine? Bill of Rights Day could not come at a worse time. Following the tragic terrorist attacks in Beirut, Paris, and most recently San Bernardino we are witnessing a new zeal for a host of repressive measures. We have also seen a wave of Islamophobia. We have seen elected officials of both parties, including President Obama in a televised national address, spew the ugly lie that all Muslims are responsible for the actions of some Muslims, that Muslims have a special duty to “police their own” and prevent terrorism, a duty that no other group has, even though more terrorist attacks in the U.S. are committed by white Christian men than any other group. This newly invigorated bigotry has led to a government offensive that pushes for programs like the FBI’s “Countering Violent Extremism” (CVE) and “Don’t Be a Puppet.” These programs are based on the false premise that “bad ideas” lead to “bad actions” and thus it is the government’s job to police bad ideas in order to prevent bad actions. Not only is this premise false, it is also impermissible for the government to take it upon itself to police ideas. These programs depend on enlisting citizens in the government’s campaign to stamp out bad ideas. CVE relies heavily on community partners, such as Mosques and schools, and Don’t Be a Puppet is aimed explicitly at schools. If the FBI has it’s way, every house of worship, public school, or other community space will become a potential site of surveillance and every community member a spy. In addition to these programs, there is the call for more surveillance. While the U.S.A. Freedom Act never was a true reform of the NSA’s surveillance program, in light of the recent terrorist attack, politicians are calling for it to be repealed. The FBI has ramped up its war on encryption citing Paris and San Bernardino as a reason why the government needs a backdoor into your electronic communications. This is in spite of the fact that there is nothing to connect encryption with either plot and that the FBI has on at least one occasion been forced to admit that the type of backdoor that they want into American consumer products would have no effect on groups like ISIS. This is, of course, only a roundup of what has happened in the last month. The last several years have witnessed a whole host of assaults on the Bill of Rights from attempts at the state level to criminalize undercover investigations of factory farms, the systematic attempt to silence defenders of Palestinian human rights, continued unchecked police brutality, torture in the form of solitary confinement, and what seem like weekly revelations about national and local law enforcement spying on First Amendment protected activity. When we reassess the state of the Bill of Rights in 2015 a very grim picture emerges. It is easy to feel overwhelmed by the wave of reaction we are facing as a nation. What is important to remember is that you are not alone, that there are movements across the country not only fighting back, but pushing forward and expanding the concept of freedom and human rights. These types of mobilizations have won important victories in the past and they are essential to winning victories in the future. Just a few months after Roosevelt issued this proclamation his Vice President Henry Wallace delivered a speech about what victory in World War II would mean. Originally titled the “Price of Victory” it is commonly know as the “Century of the Common Man,” or simply the “Common Man speech” due to Wallace’s insistence that 20th century must be “the century of the common man,” as opposed to an American, British, German, or Russian century. He spoke of an ever-growing recognition of freedom and human dignity that was pushed forward and expanded through the actions of the “people” or the “common man.” Wallace said, “The march of freedom has been […] a long drawn out people’s revolution.” This is how we should view the unfulfilled nature of the Bill of Rights, not as a bad promise, but as part of “march of freedom” or drawn out “people’s revolution,” whose final conclusion can only be achieved through the fulfillment of the promise of the Bill of Rights, whose fulfillment can only be achieved by the people themselves. Using the language of Langston Hughes, the Bill of Rights may “never have been,” but it “must be.” Only though, when all of us organize together, can the promise of the Bill of Rights be fulfilled.